Independent app developer Tim Sears has just released his latest creation for iPhone, and if you are a Foursquare user, this is one for you. Future Checkin utilizes the new background location features available with iOS 4 and allows you to check-in to your favorite, recent or nearby venues without even getting your phone out of your pocket. Many users of Foursquare (myself included) have been screaming for a feature such as this for the iPhone app, as getting your phone out every time you are at a new venue has become very tiresome. Basically, it’s a one time setup that involves signing in with your Foursquare credentials. Once linked, you are presented with a list of nearby places, as well as places that you have been to recently. You choose your regularly visited venues and add them as favorites. That’s it. The app will now remember those favorites in the future and thanks to GPS, it will automatically check you in every time you are there. The application’s preference pane allows you to control various options, including check-in settings, frequency of GPS updates, notifications and even has a kill switch for when you want to stay off the radar completely . It’s worth noting that leaving the location function on all the time is a massive battery hog, so you will need to play around with the GPS update switch to find the balance that works for you. In my case, just under the halfway point is the sweet spot for me, but it is not often I am away from a charging point of some form. So what is the future for Future Checkin? Sear’s writes on his Twitter stream that Gowalla integration is coming as soon as he can get access to the API (hopefully this week). Adding multiple location services will really help with what has come to be known as “check-in fatigue” — the process of manually checking-in to multiple services. The reviews on the app store are mixed. Some are say this is the best thing ever, while others are complaining of total failure. In my opinion, this feature should be included in Foursquare’s official app. But in the meantime, this is a solid alternative to manual check-ins. I have been wandering the streets of my hometown and found it works a treat! I can wholly recommend this app if you are a moderate to heavy Foursquare user. 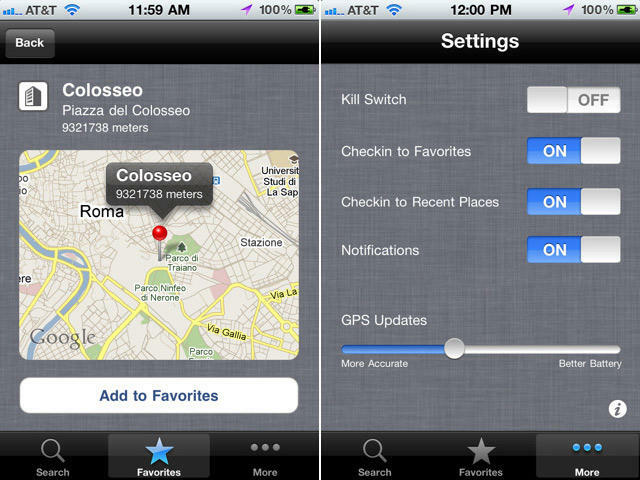 Because of the background activity features, the app will only work on iPhone 3GS and iPhone 4 running iOS 4. Future Checkin is in the app store now for the special 50% off price of $0.99/£0.59. Go get it!